Last Saturday there were major construction works on the rail network in London. Euston station was closed. I had to travel from Glasgow to the south of London. I had originally booked a return ticket Euston - Glasgow - Euston via Virgin's website, well in advance. 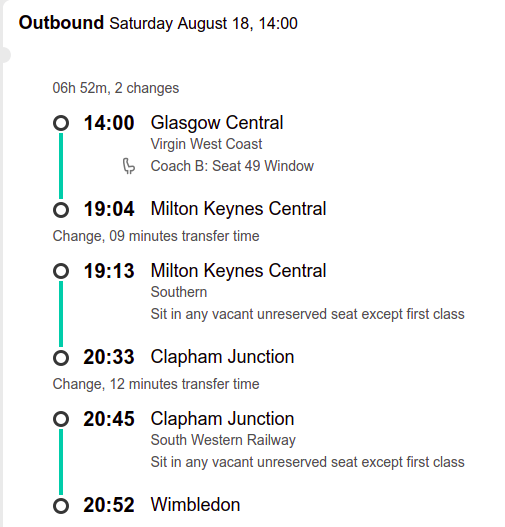 When I was made aware of the engineering works in the middle of July (which resulted in my train being cancelled), I called Virgin to re-book, and they offered me an alternative to go from Glasgow via Milton Keynes and Clapham Junction. That sounded reasonable. Their price would have been higher than my original ticket though, and I saw the exact same connection on Trainline for half the price. When I told them they said they can only offer tickets for the same price or higher when re-booking, and offered to refund the return ticket instead so I could book myself, which I did. This question is about that new one-way ticket from Glasgow Central to Wimbledon via Milton Keynes. The pre-story is just included for a frame of reference. Fast-forward to Saturday; I went on the Virgin train to Milton Keynes, and the train via Clapham Junction that Trainline said I should take did not exist. It wasn't cancelled, it didn't not show up. It simply wasn't scheduled. The only thing that was there was a train to Hemel Hempstead operated by London Northwestern Railway, and then a replacement bus operated by them to Stanmore Underground station, where we could take the Jubilee line into London. This added a good two extra hours to my journey. It was obvious there would be engineering works, and that's why I tried to plan ahead. However that didn't work out. I would now like to claim compensation because I was late, but I don't understand from whom. I believe it's not Southern's1 fault for not showing up to take me to Clapham Junction. That train was not late, or cancelled. It was not advertised on the board in the station, it didn't show in the live departures at National Rail's website when I checked while I was in Milton Keynes. It simply did not exist. I believe I should not have been sold that ticket. It's an Advance Single ticket that has a seat reservation for the Virgin leg, and no information about what trains exactly to take after that. I bought it on the 20th of July. Here are the trains that the confirmation email showed. The Trainline app still showed the trains that it originally claimed I should take (via Clapham Junction) when I was traveling. Clearly there was something wrong with the ticket booking system in the backend, or both Virgin and Trainline wouldn't have offered me the same route for a train that could not run. Chatting to Trainline yielded hardly any new information. They didn't fully understand the problem and say I should claim from Southern. They also claimed Southern altered the timetable, but couldn't back that up. Whom do I claim my compensation from, and how? 1) The direct trains between Milton Keynes and Clapham Junction (and thence to East Croydon) are part of the Southern Railway franchise. They should have operated the train that I bought a ticket for. Services between East Croydon / Clapham Junction and Watford Junction / Milton Keynes will not run between Shepherds Bush and Watford Junction / Milton Keynes Central. Please note, these services have been suspended due to a shortage of train crew. Customers should use alternative routes. More details can be found here. Customers should use alternative Southern service to / from London Victoria, London Underground services by any reasonable route between London Victoria and Stanmore, and on London Northwestern Railway bus services between Stanmore and Milton Keynes Central via Hemel Hempstead. As MadHatter states in the comments, you should thus be able to claim compensation from Southern via Delay Repay. OK, there's a few things here. 1) You shouldn't have had to have bought a new ticket just because they scheduled engineering works after you'd already booked. Your ticket should have been honoured on other trains (National Rail Conditions of Travel paragraph 28.2) on the day given you had what was a valid itinerary at the time which is now made invalid through no fault of your own. It's one thing if you actually saved money by rebooking (ie the rebooked ticket was actually cheaper than what you originally paid and you got a full refund from your original ticket), but it's quite another if you ended up paying more — this isn't clear from your original post. Though it gets a bit more complicated if you particular care about having reserved seats, I must admit. 2) Delay repay on trains removed from the system* is a little nefarious. Realistically since you did end up rebooking, I would for simplicity's sake look at claiming against what happened with your final booked itinerary. In this case, as others have mentioned, Southern removed the train from the system at short notice due to a shortage of train crew. It is NOT the fault of The Trainline, assuming (as seems likely here) Southern didn't remove their train from the system until after you booked it. Part F of the Conditions of Travel linked above clearly set out your rights when it comes to delays and cancellations, but it's never explicitly mentioned whether "cancellation" just refers to on-the-day cancellations or also trains cancelled further in advance. I think the most reasonable interpretation would be the latter, so I would assume that and work from that basis, personally. I would therefore submit a delay repay claim to Southern — if the web form won't let you (eg because you can't select the train you were booked on due to it having been removed from the system), send the claim by email instead. If they cause a fuss, you can escalate it to Transport Focus. I doubt you will be completely denied the claim, especially if you show them your original booked itinerary, but if you do, I would be reasonably confident that appealing to Transport Focus will ultimately prove successful. I have, in the past, claimed compensation for a delay from one company, who passed my claim on to the operator who was held to be responsible, who then compensated me. I guess this caused a small delay to my claim but, as I recall, it was all sorted out within a couple of weeks, which was plenty fast enough for me. This leads me to believe that you should claim compensation from any of the companies involved and they will pass your claim to the correct company. The situation in my case was that I took a local train, followed by a regional train, followed by a long-distance train. Becuase I knew there were delays on the regional route, I took and earlier train than originally planned, so I could have my reserved seat on the long-distance train. As it turned out, all three trains were late, with the long-distance train being more than half an hour late. I claimed compensation from the long-distance company, since I had successfully caught their train, which I'd always planned to catch, but which was late. They, (unfairly in my opinion, but not my problem), passed the claim on to the local train operator, who compensated me. Not the answer you're looking for? Browse other questions tagged uk trains tickets compensation or ask your own question. 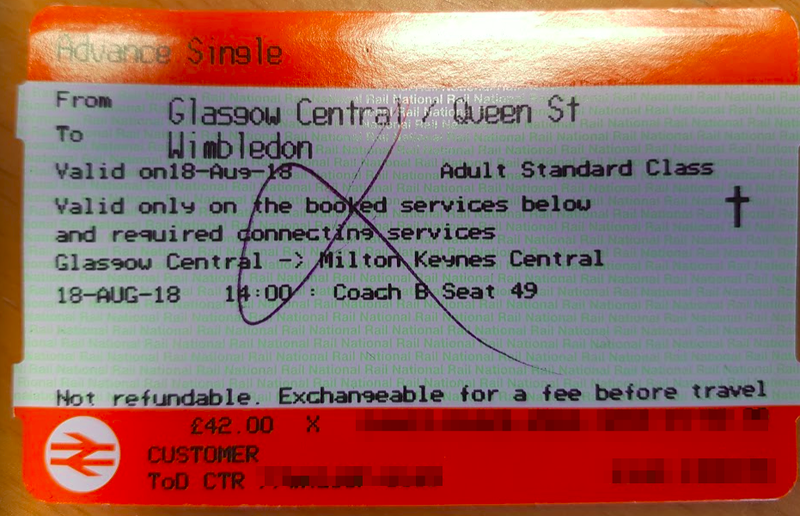 What are the limitations of a ScotRail Off-Peak Day Ticket?